The tools and publications listed on this page help the user develop a fully considered, cooperative, evidence based plan for school and community. Graphs and maps (see mapping data) are great visual tools for collaborating and planning. When school location is coordinated with other community services, student access to educational opportunities is improved. Coordinated services can dramatically reduce costs. Refurbishing or expanding schools in areas with existing infrastructure, student density, and multiple opportunities for shared use, can dramatically decrease taxpayer costs. 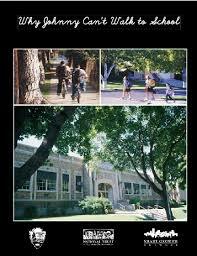 A more complete story of why school siting is so vital to healthy finances and a healthy community can be better understood by reviewing the information found through these links. The resources listed here showcase barriers to walking and biking (see Why Johnny Can't Walk to School) as well as best practices and innovative solutions (Fielding Nair) for the issues facing schools today. Active School Neighborhood Checklist - a tool for assessing school sites based on their walkability and bikeability, find your score! 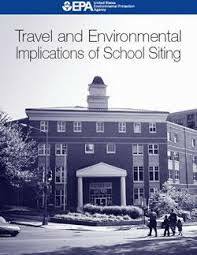 How Do School Siting Policies Affect Travel Patterns?